At Shawnessy Smiles, we offer South Calgary Partial Dentures for patients with missing teeth! Patients who are missing one or more teeth, benefit from removable partial denture to reestablish the function of their mouth. 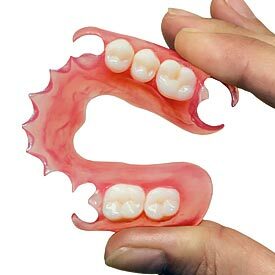 Partial dentures are made from durable materials that resemble your gum tissue and missing teeth. The metal framework is designed to clip onto the remaining natural teeth in order to hold the denture securely in place. There are many alternatives to partial dentures! At Shawnessy Smiles we often recommend dental implants to replace missing teeth in a number of different ways. Dental implants may be used to support a dental bridge, to replace a single tooth with a dental crown or with an implant supported denture. An implant supported denture clips dentures securely into place offering for more support. Unfortunately, not everyone is an ideal candidate for dental implants. If you would like to learn more bout dental implant treatment, we offer dental implant consultations to help you make the best decision regarding your oral health. We know that restoring your natural teeth for a lifetime of beautiful smiles is important to you, which is why we offer South Calgary Partial Dentures to help you achieve your goal for optimum dental health. Call us today at (403) 254-1124 to schedule your appointment with Dr. Roman Koutsil to learn more about your options for South Calgary Partial Dentures at Shawnessy Smiles Dental Clinic!